Based in Toronto, Christine Pillman has worked as a writer and editor since 1996. She has worked for Harlequin Enterprises, "Scott's" directories and "Boards" magazine. Pillman earned an honors B.A. in English from the University of Toronto, as well as a diploma in book and magazine publishing from Centennial College. 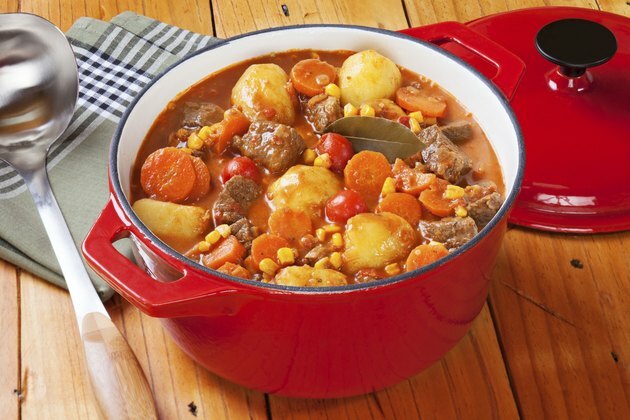 Loosely defined, a stew is a dish of meat and vegetables slow cooked in a closed pot at a simmering temperature. The most-common stewing meats are tougher, less-expensive cuts of beef that require careful braising to achieve the best results -- usually the brisket, chuck, flank, round and rump. These cuts of beef come from the well-exercised muscles of the cattle, which though tough, tend to carry a lot of flavor. Done properly, the moist heat and slow cooking produce tender, flavorful meat. The key is keeping the temperature at a simmer, not a boil. Never let a stew get hot enough to bubble. Turn the stove on high heat and place a heavy pot on the burner. Pour 2 tbsp. of canola oil in the pot and allow it to heat up. Sear the cubed meat on all sides. This browning, known as the Maillard reaction, doesn’t seal in the meat’s juices as is commonly believed; it does, however, enhance the flavor as the sugars and proteins in the meat react under the high temperatures. Remove the browned meat from the pot and set it aside. Mix 3 tbsp. of flour or cornstarch with the oil and beef fat left over in the pot. Add a few cups of beef or chicken stock, mix it well and allow it to simmer for a few minutes to form your gravy. Add the meat and vegetables into the gravy. Root vegetables work well, as they take a long time to cook -- potatoes, turnips, carrots and parsnips are common choices. Simmer the stew gently at low heat. The collagen, a connective tissue, is in high supply in these tougher cuts of meat. When cooked in moisture, the collagen dissolves into a gelatin and the meat fibers separate more easily. The higher the cooking temperature, the tougher the meat fibers become; a boil produces rubbery, chewy stewing beef. A gentle simmer is necessary to tenderize the meat. Check the meat every so often to see if it’s done. Tougher or larger cuts of meat will require a longer cooking time. The temperature at which you simmer requires a careful balance: it must be high enough to kill microorganisms and low enough that the meat will tenderize. Aim to keep the temperature between 180 and 190 F. Homemade stock is lower in sodium and you can skim the fat off before adding it to your stew.